Citizens Bank Park is a baseball park located in Philadelphia, within the South Philadelphia Sports Complex. It is the home of the Philadelphia Phillies, the city's Major League Baseball (MLB) franchise. It is commonly referred to by locals simply as "The Bank" or "CBP". Citizens Bank Park opened on April 3, 2004, and hosted its first regular season baseball game on April 12 of the same year, with the Phillies losing to the Cincinnati Reds, 4–1. The ballpark was built to replace the now-demolished Veterans Stadium (a football/baseball multipurpose facility), and features natural grass and dirt playing field and also features a number of Philadelphia-style food stands, including several which serve cheesesteaks, hoagies, and other regional specialties. The ballpark lies on the northeast corner of the Sports Complex, which includes Lincoln Financial Field, Wells Fargo Center, and Xfinity Live!. The stadium's capacity is 43,651 seats. In 1999, the Phillies and the Philadelphia Eagles of the National Football League joined their Western Pennsylvania counterparts, the Pittsburgh Pirates and the Pittsburgh Steelers, in making requests to replace both Veterans Stadium and Three Rivers Stadium in Pittsburgh with separate stadiums. Pressure for new Philadelphia stadiums increased after a railing collapsed at The Vet during the 1998 Army–Navy Game, injuring eight cadets. The Pirates threatened to leave Pittsburgh in 1997, which helped convince the legislature to approve funding for the four proposed stadiums. While Allegheny County and the City of Pittsburgh approved the pacts swiftly, due to plans already being in place at the time of legislative approval, debate within Philadelphia's city leadership carried on as Pittsburgh opened their stadiums (PNC Park for the Pirates and Heinz Field for the Steelers) in 2001. The Eagles agreed to a site slightly southeast of Veterans Stadium, which would become Lincoln Financial Field. The Eagles' stadium was built on the site of an old food warehouse and celebrated its grand opening in August 2003. The Phillies originally wanted a downtown ballpark similar to Baltimore, Denver, Cincinnati, Cleveland, Detroit and San Francisco. Various locations were proposed, initially at Broad and Spring Garden streets, Spring Garden and Delaware Avenue and next to 30th Street Station, where the main post office was located. The team and the city announced that the site would be at 13th and Vine streets, just north of Interstate 676, within walking distance of the Center City downtown district. There was considerable support for a downtown ball park from business and labor and the city at large, but residents of the city's Chinatown section protested. The City and team eventually settled on building at the South Philadelphia Sports Complex, on the site of an old food warehouse much like Lincoln Financial Field. In the years that followed, residents, fans and owner Bill Giles expressed regret that the new ball park was not located in Center City. Regardless of location, the team set records in 2010 for attendance (3,647,249 fans, averaging 45,028) and sellouts (81), extending a streak dating back to July of 2009 to 123 straight sellouts. The new stadium was designed by EwingCole's Stanley Cole, who was the stadium's chief architect. The unveiling of the park and ground breaking ceremonies were on June 28, 2001. Following the game that evening, the location of the left-field foul pole was unveiled at the outset of the team's annual 4 July fireworks display. On June 17, 2003, Citizens Bank agreed with the team to a 25-year, US $95 million deal for naming rights and advertising on telecasts, radio broadcasts, publications and inside the facility. The ballpark was officially topped off on August 12, 2003, and opened in April 2004. Shortly after the park opened in 2004, the bullpens were reassigned so the Phillies' pitchers used the lower pen and visitors use the upper pen. This was done to give Phillies' pitchers a better view of the game and to protect them from heckling by rowdy fans. However, the team forgot to rewire the bullpen phones after the bullpens were reassigned; so during the first game, the dugout coaches had to communicate with the bullpens by hand signals. In its first years, Citizens Bank Park allowed 218 home runs in 2004 and 201 in 2005. More than half of those home runs were to left-field. Following the 2005 season, the left-field wall was moved back 5 feet (1.5 m). Even with these modifications, the park has a reputation as one of the most hitter-friendly parks in baseball. In 2009, it gave up 149 home runs, the most in the National League and second in the majors behind only the new Yankee Stadium, but has been neutral since, with a .997 park factor in 2011. Randy Wolf of the Phillies threw the first pitch at 1:32 pm EDT on April 12, 2004 to D'Angelo Jiménez of the Reds, who got the park's first hit, a lead-off double. Bobby Abreu of the Phillies hit the first home run, which also served as the franchise's first hit in the club's new home. Reds pitcher Paul Wilson earned the first win in that game and Danny Graves earned the park's first save. On June 14, 2004, Phillies first baseman Jim Thome hit his 400th career home run to the left-center field seats at Citizens Bank Park. The first inside-the-park home run was hit by Jimmy Rollins on June 20, 2004, against the Kansas City Royals. The Eastern League Reading Phillies hosted the Trenton Thunder on May 9, 2005 at CBP; Reading beat Trenton 5–3. On September 14, 2005, Andruw Jones of the Atlanta Braves hit his 300th career home run which went 430 feet (130 m) off Phils reliever Geoff Geary in a 12–4 Phillies win. The ball landed in the upper deck in left field. 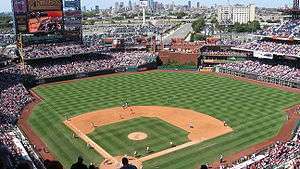 The Phillies lost their 10,000th regular-season game in their history on July 15, 2007 to the St. Louis Cardinals, 10–2, marking the first time a professional sports franchise reached that plateau. The park hosted its first World Series game on October 25, 2008, with the Phillies defeating the Tampa Bay Rays, 5–4 in Game 3. Before the game, country music singer Tim McGraw, the son of the late Phillies closer Tug McGraw (who had recorded the last out in the Phillies' World Series victory in 1980), took a handful of his dad's ashes and spread them on the pitcher's mound just before handing the ball used in throwing out the ceremonial first pitch in the game to Steve Carlton. The elder McGraw died from a brain tumor in 2004. Four days later, the Phillies completed a suspended Game 5, defeating the Rays, 4–3, and claiming the franchise's second World Series championship in front of a park record crowd of 45,940. The Phillies held their post-parade celebration at the park on October 31. On June 25, 2010, Citizens Bank Park hosted the first regular-season game in a National League stadium in which the designated hitter was used; Major League Baseball moved the Phillies' series against the Toronto Blue Jays from Rogers Centre to Philadelphia, citing security concerns for the G-20 Summit. Ryan Howard served as the first DH in a National League ballpark. Despite playing in their park, Philadelphia was designated as the road team. The first no-hitter at Citizens Bank Park was thrown by Roy Halladay on October 6, 2010 against the Cincinnati Reds in the first game of the 2010 NLDS. Citizens Bank Park hosting the 2012 NHL Winter Classic. 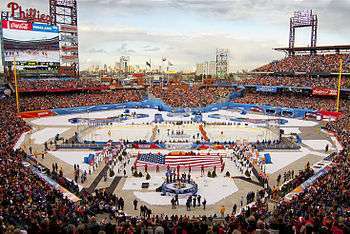 On January 2, 2012, Citizens Bank Park hosted the fifth annual NHL Winter Classic between the long time division rivals New York Rangers and Philadelphia Flyers before an SRO crowd of 46,967. The game, which was televised throughout the United States and Canada by NBC and CBC, was won by the Rangers, 3–2. Two days earlier on New Year's Eve, 45,667 had attended an alumni game played between teams made up of former Flyers and Rangers who had retired from the NHL between the 1970s and 2011 of which eight (four on each team) were also members of the Hockey Hall of Fame. The Flyers' starting goalie for the game, which was won by the Flyers alumni, 3-1, was Hall of Famer Bernie Parent. He had made his first on ice appearance since his playing career ended prematurely due to an eye injury suffered during a game against the Rangers played at the neighboring (although since demolished) Spectrum in February 1979. Four days after the 2012 NHL Winter Classic game, a third sell out crowd of 45,663 filled the Park on January 6 to watch the Flyers' AHL farm team, the Adirondack Phantoms, defeat the Hershey Bears, 4-3, in overtime. That crowd exceeded by a factor of more than two the previous largest gathering (21,673) to ever attend an AHL game since the league was established in 1936. With the normal 43,651 baseball seating capacity of the Park having been increased by more than 3,000 with the installation of temporary bleachers built over the bullpen area in center field, the trio of outdoor hockey games drew a combined total of 138,296 over the week of Winter Classic events. Behind center field is Ashburn Alley, named after Phillies Hall of Fame center fielder Richie Ashburn, who played for the team from 1948 to 1959 and was a Phillies broadcaster from 1963 until his death in 1997. It is seen by Phillies fans as a compromise between the Phillies and their fans, many of whom wanted Citizens Bank Park named in honor of Ashburn. Ashburn Alley is named for the slightly-overgrown grass which bordered the third base line at Shibe Park where Ashburn was famous for laying down bunts that stayed fair. The new Ashburn Alley, located near Ashburn's defensive position, is a walkway featuring restaurants, games and memorabilia from Phillies history. Ashburn Alley also features a memorabilia shop and a large bronze statue of Ashburn directly behind center field, as well as the U.S. flag, the flags of the Commonwealth of Pennsylvania and the City of Philadelphia, a POW/MIA flag and the flags from the Phillies' championships (below). All-Star Walk — Granite markers pay tribute to Phillies players that have played in the MLB All-Star Game since its inception in 1933 and runs the length of Ashburn Alley. Bull's BBQ — Located at the eastern end of the Alley, it is named in honor of and owned in part by former Phillies outfielder Greg "The Bull" Luzinski. This southern-style barbecue features ribs, turkey legs along with pork, beef and chicken sandwiches and "Bulldogs" (kielbasa). Seasons Pizza – A new pizza franchise in CBP that took over for Peace A Pizza starting in the 2008 season. Planet Hoagie – Local franchise that makes hoagies, including one named after a Phillies player each series. Campo's — Philadelphia cheesesteaks, replaced Rick's Steaks in 2009. The original Campo's opened in 1947. Tony Luke's — Tony Luke's famous cheesesteaks and roast pork. Games of Baseball — Sponsored by Citizens Bank, this interactive area features a video trivia game, where players compete for prizes, a run-the-bases game with the Phillie Phanatic, and a "Ring 'Em Up" game (formerly a "Pitch 'Em and Tip 'Em" game) where you can throw at targets of a catcher. Prior to 2010, a huge 22 feet (6.7 m) high baseball themed pinball game was in this area. Players earn coupons and exchange them for prizes at a kiosk such as hats, shirts and other ballpark-imprinted memorabilia. Harry The K's Bar and Grille — Named for late Phillies broadcaster Harry Kalas, the bi-level bar and grill is built into the base of the scoreboard, and serves finger foods and sandwiches, including "The Schmitter". Memory Lane and Phillies Wall of Fame — A history of baseball in Philadelphia is located behind the brick batting eye in center field, while the opposite wall commemorates members of the franchise who contributed to the franchise's history. It was in this area where Ryan Howard hit two of the park's longest home runs, on April 23, 2006 against the Marlins off Sergio Mitre, and against Aaron Harang of the Reds on June 27, 2007, currently the longest home run at Citizen's Bank Park at 505 feet. Second baseman Chase Utley's homer was also into this area against the Astros on April 23, 2007 clearing the center wall and becoming only the second player to reach the Memory Lane area after Howard. Exposed Bullpens — Located in right-center field, the bi-level bullpens allow the fans to get very close to the players (especially the visiting team, who sit in the top level). Fans are allowed to heckle but must keep it clean. The section above the bullpen that contains the Phillies Wall of Fame is closed to the public about 30 minutes prior to first pitch and remains closed throughout the game, re-opening at the game's conclusion. Rooftop Bleachers — Inspired by the 1920s and 1930s stands on North 20th Street outside Shibe Park, this area replicates the seating similar to that outside Wrigley Field in Chicago. During the 2008 season, fans could go on top for $15 on Thursday home dates and get special food offers and events. Starting Lineup — The Phillies starting lineup that day is illustrated by giant 10-foot-tall (3.0 m) by 5-foot-wide (1.5 m) baseball cards as fans enter the left field gate. In 2004 and 2005, organist Paul Richardson performed from Ashburn Alley, as Citizens Bank Park was built without an organ booth. The food at CBP was named as Best Ballpark Food in a survey of Food Network viewers in the first annual Food Network Awards which first aired on April 22, 2007. On August 14, 2007, it was announced that Citizens Bank Park was voted #1 by PETA as America's most vegetarian-friendly ballpark, which was repeated in 2008, 2009, 2010, and 2012. Citizens Bank Park (right), the newest (2004) of the four venues which made up Philadelphia's "Sports Complex" at that time, the four-decade-old Wachovia Spectrum (center), the oldest (1967) facility at that time (the arena closed October 31, 2009. and was demolished in 2011), tree lined S. Broad St (left), and the city's expansive skyline along the horizon to the North, as viewed from the roof of the Wells Fargo Center (Philadelphia) (1996). Diamond and Hall of Fame Clubs — Two premium seating areas in the park. The Diamond Club, located behind home plate, includes an air-conditioned indoor club area with exclusive food and souvenir shops where ticket holders can watch batting practice on either side of the club (especially on rainy days). There are a total of 1,164 seats in the Diamond Club. A second level, called the Hall of Fame Club, is located between Sections 212 through 232. This air-conditioned area features exclusive food and souvenir stands akin to The Diamond Club, and also houses memorabilia from the teams' past going back to the 1880s, along with memorabilia from the Philadelphia Athletics. The Hall of Fame Club contains 6,600 seats. In addition to being an attraction to fans, the Hall of Fame level also houses the A/V crew on the first-base side of that level that controls the scoreboard and all other monitors throughout the park and is where Dan Baker announces the game, as well as the press box, television, and radio booths. 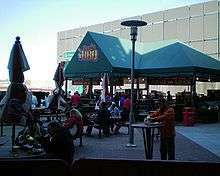 High and Inside Pub — Located on the Terrace Level behind home plate, the area is open to groups before the ballgame, and the public once the games start. Liberty Bell Home Run Celebration — Standing 102 feet (31 m) above street level, this 52-foot-tall (16 m) by 35-foot-wide (11 m) mechanical, lighted replica of the Liberty Bell "rings" and lights up after every Phillies home run and victory. Majestic Clubhouse Store and Mitchell & Ness Alley Store — The clubhouse store is open year-round, and serves as the starting point for tours of the ballpark. The bi-level store features regular merchandise on the first level and Phanatic-themed items on the second level, while the Alley Store is open during all home games and features authentic replicas of older Phillies jerseys made by the famous Philadelphia retailer of vintage uniform shirts and caps as well as other items. During the off-season, customizable jerseys are available in the main store when a stand next to the store is open during the season. McFadden's Bar and Grille — Open year-round, this restaurant combines the McFadden's and Zanzibar Blue menus at the Third Base Gate. Since its opening, it has become a popular post-game (or event) site for the nearby Wells Fargo Center and Lincoln Financial Field. Phanatic Phun Zone — Located at the First Base Gate plaza, this playground offers fun for guests eight years old and younger with slides, climb, explore and play games. A separate area for toddlers three years old and younger is found inside. Phanatic Giant Shoe Slide — Located on the Terrace Level near home plate, kids could slide in and out of a replica of one of the Phanatic's sneakers. Removed in 2012. Besides the Richie Ashburn statue in Ashburn Alley, statues of three other famous Phillies — Robin Roberts (at the First Base Gate), Mike Schmidt (at the Third Base Gate) and Steve Carlton (at the Left Field Gate) — ring the outside of the facility. Each of the 10-foot-high (3.0 m) statues were made by local sculptor Zenos Frudakis. Other art found throughout the park includes tile mosaics, murals and terrazzo floors with outlined images of famous players in Phillies history. In April 2011, the Phillies accepted a gift of a fan-underwritten 7.5-foot-tall (2.3 m) bronze statue of legendary broadcaster Harry Kalas. Created by noted local sculptor Lawrence Nowlan, it was placed behind Section 141, near the restaurant that bears Kalas' name, after a dedication held on August 16, 2011 prior to that night's game against the Arizona Diamondbacks. The statue was unveiled two days later than originally scheduled (the originally-scheduled date is on a plaque on the ground below the statue) because of a rained-out game between the Phillies and the Washington Nationals. The Philadelphia Phillies are the first Major League Baseball team to join the Environmental Protection Agency's Green Power Partnership Program which motivates organizations across the world to purchase green power in order to minimize environmental impact. The Phillies announced on April 30, 2008 that their home field, Citizens Bank Park, will be powered with 20 million kilowatt-hours (kWh) of green energy purchased in Green-e Energy Certified Renewable Certificates (RECs). The EPA stated that this purchase holds the record in professional sports for the largest purchase of 100% renewable energy. The Phillies are among the top three purchasers of green power in Philadelphia, and the executive director of the Center for Resource Solutions, Arthur O'Donnell, wants "other clubs to take their lead." Aramark Corporation is the Phillies' food and beverage provider at Citizens Bank Park and they are taking major actions in improving the environmental impact of the Phillies' stadium. Glass, cardboard and plastics used during game day are recycled; frying oil is being recycled to produce bio-diesel fuel, and biodegradable, recyclable, and compostable products, serviceware, and plastics have been introduced. The first concert at the park was Jimmy Buffett & The Coral Reefer Band on August 25, 2005, they returned on June 14, 2008. The Eagles, The Dixie Chicks and Keith Urban were scheduled to perform on June 14, 2010, but the show was cancelled. Other performers who have played at the park include Billy Joel and Elton John in a duet concert, Bon Jovi and The Police. On July 14, 2012, former Pink Floyd member Roger Waters performed The Wall live as part of his world tour. On September 2 and 3, Bruce Springsteen played two shows as part of his Wrecking Ball Tour in front of more than 73,000 people, and he became the first act to perform at every major live music venue in Philadelphia. On August 1, 2014 Jason Aldean performed the first ever country show to be held at the ballpark. Florida Georgia Line & Tyler Farr were the openers for the show at the ballpark. Beyoncé and Jay-Z performed at the park on July 5, 2014, as part of their co-headlining On the Run Tour. On September 7, 2016, Bruce Springsteen & The E Street Band performed as part of The River Tour 2016. The show lasted for 4 hours and 4 minutes, setting Springsteen's record for his longest show performed in North America, as well as his second longest show performed in the world. This was the first of two shows Springsteen performed in Philadelphia during the week, performing two days later on September 9, 2016. Due to the City of Philadelphia's smoking ban, smoking is only permitted at the third base gate and the left field gate. Dan Baker, public address announcer for the Phillies since 1972, continues to introduce the players. During each player's first at-bat, Baker, in an excited voice, says, "Now batting for the Phillies, number (#), (position), (player's name)". For example, a first at-bat introduction would have Baker say, "Now batting for the Phillies, number 11, shortstop Jimmy Rollins!" During subsequent at-bats, players are only announced by their position and name, for example, "Phillies first baseman, Ryan Howard!" Baker only uses the city of the opposing team when he announces their players rather than the team nickname, for example, "Now batting for Atlanta, number ten, third baseman Chipper Jones", and makes the announcement in a more-subdued tone. In 2004 and 2005, Citizens Bank Park installed Daktronics video and message display in the park. One of the largest incandescent displays in Major League Baseball was installed in left field that was used as a scoreboard and for giving statistics. There are also out-of-town field-level displays installed in the park that measure approximately 10 feet high by 25 feet wide. 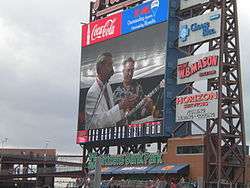 During the 2010–2011 offseason, the Phillies replaced their incandescent scoreboard with a new HD scoreboard that cost $10 million. The new screen measures 76 feet (23 m) high and 97 feet (30 m) wide, which nearly triples the size of the old screen, and is the largest HD screen in the National League. The front of the park as seen from a parking lot at Lincoln Financial Field. ↑ "Guide To Baseball Betting.com". Retrieved 14 April 2014. ↑ "Citizens Bank Park". Ballpark Digest. July 6, 2010. Retrieved August 25, 2013. ↑ "Citizens Bank Park". Global Spectrum. Retrieved August 25, 2013. ↑ Page 408, 2011 Philadelphia Phillies Media Guide. 1 2 3 4 5 6 "Citizens Bank Park Convenience Guide – Field Dimensions". Philadelphia Phillies. Retrieved July 30, 2009. 1 2 Cook, Bonnie L. (2013-03-16). "Stanley M. Cole, 89, architect of ballpark". Philadelphia Inquirer. Philly.com. Retrieved 2013-04-05. ↑ "Citizens Bank Park". Stranix Associates. Retrieved August 25, 2013. ↑ Phillies attendance figures, sportsnetwork.com, retrieved October 6, 2010. ↑ Associated Press (June 17, 2003). "Proud Citizens: Phillies new stadium to be called Citizens Bank Park". Sports Illustrated. Retrieved April 7, 2009. ↑ Center, Bill (May 17, 2004). "Urban View at Phillies' New Park Is So-So, but Hitters Are Regularly Dialing Downtown". The San Diego Union-Tribune. Retrieved June 25, 2009. ↑ "2011 MLB Park Factors". ESPN. Retrieved August 25, 2013. ↑ "April 12, 2004 Cincinnati Reds at Philadelphia Phillies Box Score and Play by Play". Baseball-Reference.com. April 12, 2004. Retrieved April 1, 2009. ↑ "BASEBALL ROUNDUP: Thome Hits 400th Home Run of Career". The New York Times. June 15, 2004. Retrieved April 1, 2009. ↑ Malmros, Kent (May 10, 2005). "A Night of Lasting Impressions for Minor Leaguers; Trenton, Reading Players Revel in Special Game at Citizens Bank Park". Minor League Baseball. Retrieved April 26, 2009. ↑ "Thunder Rained on by Reading". The Philadelphia Inquirer. May 10, 2005. pp. D05. Retrieved April 26, 2009. ↑ "September 14, 2005 Atlanta Braves at Philadelphia Phillies Box Score and Play by Play". Baseball-Reference.com. September 14, 2005. Retrieved April 1, 2009. ↑ Fastenau, Stephen (July 15, 2007). "Phils Handed 10,000th Loss; Right-hander Eaton Allows Six Runs in Four-Plus Innings". MLB.com. Retrieved April 1, 2009. ↑ "July 15, 2007 St. Louis Cardinals at Philadelphia Phillies Box Score and Play by Play". Baseball-Reference.com. July 15, 2007. Retrieved April 1, 2009. ↑ Antonen, Mel (July 16, 2007). "Phillies Are No. 1 in Loss Column". USA Today. Retrieved April 1, 2009. ↑ "October 25, 2008World Series Game 3 at Citizens Bank Park Play by Play and Box Score". Baseball-Reference.com. October 25, 2008. Retrieved April 1, 2009. ↑ Kaduk, Kevin (October 26, 2008). "Tim McGraw Spreads His Father's Ashes on World Series Mound". Yahoo! Sports. Retrieved April 1, 2009. ↑ "Colorful McGraw Had Brain Cancer". ESPN. Associated Press. February 12, 2004. Retrieved April 3, 2009. ↑ "October 27, 2008 World Series Game 5 at Citizens Bank Park Play by Play and Box Score". Baseball-Reference.com. October 27, 2008. Retrieved April 1, 2009. ↑ Jasner, Andy (January 2, 2012). "NHL makes memories at Citizens Bank Park". Philadelphia Phillies. MLB. Retrieved January 3, 2012. ↑ Rosen, Dan (January 2, 2012). "Heroics of Lundqvist, Rupp lift Rangers to Classic win". NHL.com. Retrieved January 3, 2012. ↑ Carchidi, Sam (January 1, 2012). "Parent Steals Show As Flyers beat Rangers in Alumni Game". The Philadelphia Inquirer. Retrieved January 1, 2012. ↑ Narducci, Marc (January 7, 2012). "Phantoms Wear Out Bears Outdoors". The Philadelphia Inquirer. Retrieved January 7, 2012. ↑ Morrison, John F. (2013-08-08). "Lawrence J. Nowlan Jr., 48, sculptor who was working on Frazier statue". Philadelphia Daily News. Retrieved 2013-08-27. ↑ "Phillies Accept Fan-Funded Harry Kalas Statue". philadelphia.phillies.mlb.com. March 31, 2011. Retrieved March 31, 2011. ↑ "Harry Kalas Statue Unveiling Set for Sunday, August 14, During Phillies Alumni Weekend". philadelphia.phillies.mlb.com. August 4, 2011. Retrieved August 5, 2011. 1 2 Jasner, Andy (April 30, 2008). "Phils to Lead Clean Energy Movement". MLB. Retrieved June 4, 2008. ↑ "Philadelphia Phillies Knock It Out of the Park With Green Power". United States Environmental Protection Agency. April 30, 2008. Retrieved April 30, 2008. 1 2 George, John (April 30, 2008). "Phillies Fans of Green Energy". Philadelphia Business Journal. Retrieved April 30, 2008. ↑ "Roger Waters Makes Hit Triumphant Return to North America with His Extraordinary Aural and Visual Masterpiece: "The Wall"". philadelphia.phillies.MLB.com. November 1, 2011. Retrieved November 1, 2011. ↑ "Bruce reaches Philly landmark with September 2 & 3 concerts". August 20, 2012. Retrieved August 20, 2012. ↑ "On The Run Tour: Beyonce and Jay Z". Live Nation Entertainment. PR Newswire. April 28, 2014. Retrieved April 28, 2014. ↑ "Springsteen breaks concert length record yet again in Philly; see the setlist". NJ.com. September 8, 2016. Retrieved September 13, 2016. ↑ "Philadelphia Phillies: Ballpark information". ↑ Zolecki, Todd (January 19, 2011). "Phillies Upgrading Scoreboard With HD Display". philadelphia.phillies.mlb.com. Retrieved January 20, 2011. Wikimedia Commons has media related to Citizens Bank Park.